Blended learning is an education form where you combination traditional classroom learning and virtual learning. The area blended learning is very broad and there are several variations. Blended learning is very much about performing activities virtually and combining it with classroom discussions about the approach for solving the activities. It is quite common with a certain “event feel” during a blended learning experience. This is to motivate and give a positive impression of the training. Below are two examples of products we have developed for use in blended learning concept. Both have been very successful and are used by the largest companies in each industry: Case # 1 Eco2Trainer Eco2trainer is a virtual training tool for ecodriving training. The product has a strong educational foundation combined with gamification elements. Theory and virtual learning are mixed with entertainment in a way that gives very good results. The tool is currently used by the largest driving schools in Sweden, Norway, Denmark and Finland. Read more here: Eco2Trainer Participants consistently reduced their fuel consumption by 12-15%. Moreover, the education is very appreciated, with almost 100% satisfied participants each time. 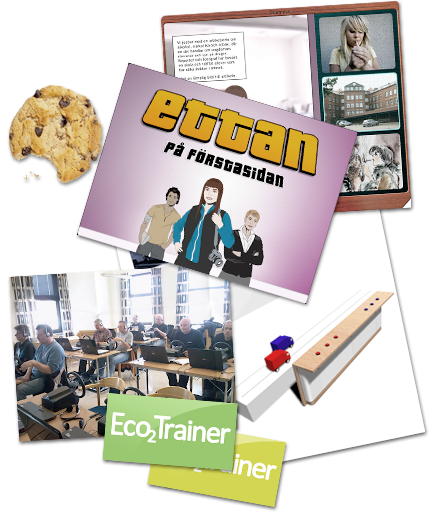 Case # 2 The Journalist game “Ettan” “Ettan” is used by most of the larger Swedish newspapers to teach visiting schools newspaper ethics and evaluation of news stories. The game gives the students a unique opportunity to test how to evaluate a news story and how to think about the moral aspects of news publishing. The game is a good example of the successful use of blended learning. If you think Blended Learning is a concept that might be interesting for your business, contact us! Please take a look at our portfolio for examples of our previous work.